Launch Thunderbird and click on Tools, Account Settings, Account Actions and Add mail account. If it is a new Thunderbird setup, you will be prompted for this by default. Type in your name, email address and password. Then press Continue. Re-test the configuration. You will end with the green and orange indicators shown here. Now press Create Account. 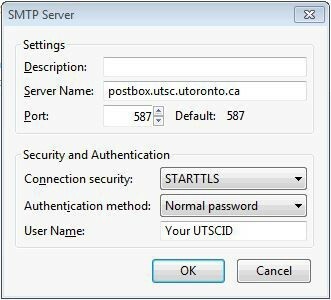 Click on Tools, Account Settings and select Outgoing server (SMTP) from the left column. Select postbox.utsc.utoronto.ca and click on Edit.